Ariel Sta Ana is a twotime winner of the National Music Competitions for Young Artist (NAMCYA), first taking the second prize in 1988 and winning first prize in 1992. He received his musical training at the UST Conservatory of Music under Prof. Dalmacio Cruz and at the Elisabeth University of Music in Hiroshima, Japan earning his Master of Music degree in Clarinet Performance in 1996, with Prof. Tadayoshi Takeda as his mentor. In 1999, he received his second Master of Music degree from the Elisabeth University of Music but this time in Orchestra Conducting under the tutelage of Prof. Kazukiyo Inoue. Mr. Sta Ana was a member of the Manila Symphony Orchestra in 1988 and was a concertmaster of the ASEAN Youth Symphonic Band held in Singapore in 1992. He also attended master classes of Andrew Marriner, principal clarinet of the London Symphony Orchestra, Jost Michaels, a German clarinet virtuoso and of Karl Theo Adler of the Aulos Woodwind Quintet. In Japan, he has been a member of the Hiroshima Wind Orchestra for two years and he attended the clarinet classes of the renowned French clarinetist, Michel Arrignon. He was a founding member of the Hiroshima International Music Friendship Club and performs regularly with the International Music Festival in Hiroshima, Japan. Some of his public performances include among others, Paco Park Presents, Concert at the Park, « French Spring in Manila », recital with “ensemble europa” with flutist TerukiIshibashi and pianist Eri Nakagawa and Las Pinas Bamboo Organ Music Festival with violinist and conductor Prof. Oscar C. Yatco, he was also featured soloist with the PPO in 2002 “Virtuosos” concert, featured artist in the 2005 Filipino Artist Series in CCP and the The 11th San Agustin International Music Festival in 2009. In 2010, he performed the Poulenc Clarinet Sonata with pianist Eric Ruple and the Brahms Trio with Cellist Sung Won Yang and Pianist Chi-Ying Hung in the OPUSTFEST’s International Piano Festival, and he performed the Mozart Clarinet Concerto in PPO Concert Season 2011 with the Philippine Philharmonic Orchestra together with Olivier Ochanine as conductor. At present, he is in collaboration with American flutist David Johnson, Korean pianist Hyun Joo Lee who formed the group « The Clarion Chamber Ensemble, » a group specializing in performing chamber music. 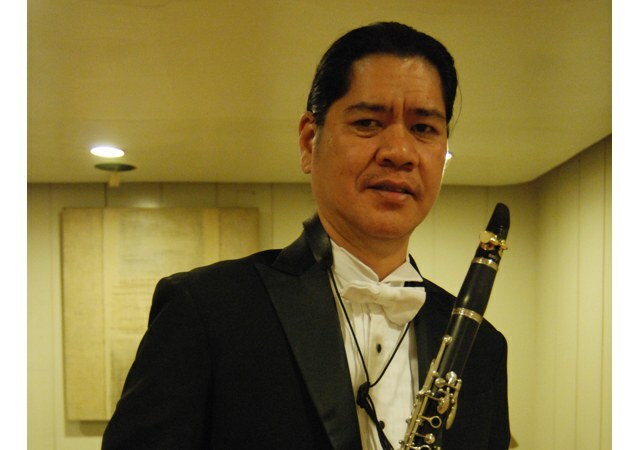 At present, he is the principal clarinet player of the Philippine Philharmonic Orchestra (PPO) and faculty at the UST Conservatory of Music and the Philippine Women’s University. He is also the founding member of the Philippine Band Association (PHILBANDA) and he serves as it’s Vice- President for External Affair. The PHILBANDA is a group aim to raise the standard of band education and performance in the Philippines through promoting wind band activities such as concerts, workshops and masterclasses.